I was chatting to my mate Tom Davies who's recently launched a bike website Chappelli Cycles. 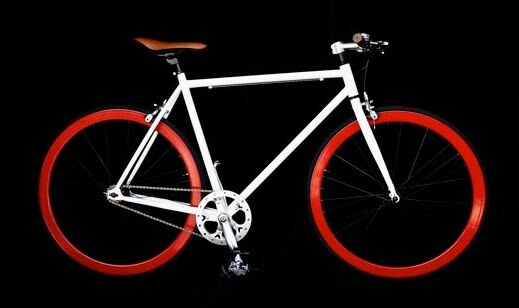 They do single speed fixed gear bicycles which are very popular at the moment. The plan for their business is to do custom bicycles but to keep things simple and test the market they launched their site with 3 designs. And one month after launching sales have beat their expectations and they've already sold out of one model. Their conversion rate (the number of people who purchase as a percentage of people who visit the site) is fantastic. In comparison, our conversion rate is abysmal. About 1 in 600 visits to our website results in a sale, that's 0.167%. A good retail website should have a conversion rate around 1-2%. Fortunately our traffic has been fantastic, so sales are still reasonable, but if our conversion rates were 1-2%... wow. So that got me thinking about why our conversion rate is so low. After talking to some customers one key reason we think it's low is that people can't make a decision, we give them too much choice. With over 3 trillion possible shoe combinations they design 20 pairs of shoes they like, then they're paralysed when it comes to making a decision, so they don't make one. In addition to their bike's looking fantastic, that theory would also help explain Chappelli Cycles excellent conversion rate - 3 choices keeps it simple. Custom bikes will no doubt drive lots more traffic via word of mouth and PR attention, then perhaps Tom should keep the ready made bikes available in addition to doing custom bikes. Perhaps we should do that with our shoes. I'd love to hear your thoughts. Do you think too much choice paralyses people when it comes to making a decision? How do we help customers overcome this? I would suspect there is another factor at play here in addition to the amount of choice that people are provided with. Given you are seeing very healthy traffic levels I would suspect you are getting quite a few visitors through who would like to check out the concept and how the designer tools work. Given your background probably coders and people in the startup space interested in seeing what an ExGoogler such as yourself is building. Maybe not the kind of people who are going to be buying designer shoes - they will probably tell others to check out your site which might result in a greater chance of a sale. At any rate, I think what you propose with some ready-made shoes (or popular designs, have social voting, etc to determine which shoes you have in that line) is only going to help your business, which IMHO looks really solid. Great post, and great site. Nice one. I was too afraid to press "start designing" might take a long time. Maybe put a 30s video. Chappelli Cycles has 'add to cart' right on the homepage, it's just too easy. 1) Lists - take a selection of the 'Top 5 Shoe Designs' from the gallery page (or based on the styles that are selling) and put them on the front page with a single click to purchase that style and a single click to customise it (similar to what you've got in the gallery). 2) Use photos of the shoes where possible instead of vectors -they're such an emotionally driven purchase that it's important to see it 'in the flesh'. 3) Get a credit card gateway or allow potential customers to login to SOP with their existing paypal login. The idea being to reduce the number of clicks and logins required to purchase. Albeit the minority, surely some people would prefer to simply enter their credit card number, rather than go through paypal. I know there are a lot of other considerations that need to be applied to the suggestions and other challenges that mean not all your ideas can be implemented immediately. 1) Bikes are targeting a unisex market. 2) Most track bike sales comes from male customers, who generally have more impulsive purchase behaviour. 3) Chappelli are capitalising on a wave of popularity around track bikes -- which has peaked in the last 6 months -- with an extremely low price point. Bottom-line: You're doing a brilliant job and if sentiment and traffic are positive, you're over half-way there. Mike, Your assumptions about the paradox of choice are well documented. The classic experiment demonstrating excessive choice was done by Sheena Iyengar, a professor of business at Columbia University. In 2000, she set up a booth in an upscale supermarket with a variety of gourmet jams and jellies, all of which scored about equally in taste tests. Sometimes she showcased 6 different jams, and sometimes it had 24 different jams. Most people would assume that more choice leads to more spending as people can identify their own particular favourite. However, what Iyengar found was that the more jams were on display the less people purchased! When her booth had only 6 jams, 30 percent of the people who stopped by the booth ended up buying something. When she put 24 varieties on display, only 3 % of people purchased! IT seems that all the possibilities short circuit the brain and cause product wariness. Hi Damon, that's a very good point. And taking a look at our referring sites in Google Analytics some of our top referrers are sites like TechCrunch (Tech blog) and Lost at E Minor (Pop Culture), so we're definitely getting a lot of traffic that isn't specifically our target market. Still, going through our referring sites more than half are definitely fashion related, so at least half our traffic is our target market. That would put our conversion rate at just over 0.3% at best which is still very low, so I guess we get onto all the things you mention and that we've been blogging about! Cheers for the comment, and I just had a read of your latest blog post. Hat tip to you for sharing your experiences and best of luck with it. Mancjew, Andy and erratio, thanks for your thoughts. Mancjew - interesting feedback on you thinking 'start designing' would take too long. And there's definitely something to be said for an add to cart button on the home page. Andy - excellent thoughts on adding top designs to the home page and using photos as much as possible. We end up selling quite a few shoes exactly as they are in the gallery, so what you suggest makes sense. Re: credit cards, we're working on that, it's a good point. Thought customers only notice that we only offer PayPal after they're ready to purchase their design, and we don't lose anyone in the purchase funnel at that point so it shouldn't be too major an issue we don't think. Good thoughts on bikes being a very different market too. I've been to your site maybe 20 times? and I show friends some of those times too- I haven't purchased yet (investment, want to get it right) but I will! One way to overcome it would be to do what http://www.spoonflower.com does. They're all about custom fabric (swoon!) but have the monthly competition for the fabric that goes into a larger run print. Interactivity + less choice. Having a "so+so's shoe" available to purchase for a slight discount on a monthly basis might assist. Also.... if my shoe were up for voting, then I would be spreading the word to get people to vote for me! double bonus! Further to some of the other comments above... perhaps you could add some copy along the lines of "Design your own custom shoes in 3 steps", to support the "Start Designing" button. This additional copy would work well as a link through to the short video suggested above. Ahhh... one more thing. Lara's comment just sparked off the idea of actually giving names to the various finished designs -or having customers name their own. I think creative names given to each design would work better than using an individual's name. If you use the name I come up with for my design, I'm still going to tell all my friends. But the design would retain more appeal for people I don't know if it wasn't just called "Andy's patent red heel". These are some interesting questions and ideas that are posed. This screams to me time for A/B testing your content and see whether limiting the number of choices does indeed affect conversion rates. Google Website Optimiser would be the way to go here. I suspect it may still be early days to be worrying about low conversion rates. Buying shoes can be a very personal affair where people want to take their time to ensure they are making the right fashion choice. I'd be interested in your Days to Purchase and Visits to Purchase reports. I'm guessing they may be tending in the 4-6 visits range. Then the challenge becomes: how do we get a majority of our visitors purchasing within 1-3 visits? In any case I suspect simplifying your choices and purchase funnel should pay dividends. Your Goal Funnel reports should help you identify some opportunities. Not sure if you've implemented event tracking in your design software - but if you have, it should also allow you to see what are people's most popular choices during the design phase. Using that data to float the most popular choices to the top should help simplify the design process. Just my 0.02. Good luck! From a sales perspective, I have ALWAYS found giving customers too much choice often leaves them with too many options, and leaving without the sale. 1 reason for this I have found to be it's hard to understand the key benefits of the proposition(s) on offer, when there are so many differences. Let's use a cake as an example. I like chocolate cake, If I'm presented with 3 types of chocolate cake, I can ascertain key individual elements of those 3 cakes (frosting, filling, decorations) to a pretty precise level of detail, to help me make my decision. If I'm presented with 20 cakes (chocolate, sponge, cheesecake), all my decision-making time/effort is taken up to get to the fact I like Chocolate cake. By the time I get to decding on chocolate, I feel I'm no closer to what I want than when I started and may feel keeping going is just too hard. I don't get to the nuts and bolts of what I want quick enough. All in all though, anyway you can simplify things and get your buyers to the final destination quickly will help your conversion. Some more fantastic thoughts here, thanks guys. Anonymous - thanks for passing the site on to your friends, we appreciate that a lot. And it's good to hear that you fit into our regular visitor category and you plan to make a purchase, you're just taking your time to ensure you get it right. Hopefully lots of our regular visitors are in the same category as you! Lara - regular competitions then promoting the winning design is a very good idea, I like that. Our initial thought was doing something like that might take away from the message that this is a design your own shoe site, but I think the way Spoon Flower have executed the idea almost adds to that message. Andy - good thought, pointing out that the process to order is easy is a good idea. - Half our purchases happen on the day a customer visits our site. The other half are fairly spread out. 16% of people purchase 2 days after first visiting our site and some take as long as a couple of months. - Only 36% of customers purchase on their first visit. 19% on their second visit. The rest are very spread out. Mike implemented event tracking in the designer about a month ago. I haven't played with event tracking data before so I should watch a few videos on it and get myself up to speed. Selecting leather colours and types is the most popular event, people clearly love colour. David - very good thoughts on the sales process and your cake analogy is a good one. I bet that's what a ton of people are going through on our site. Now to think through ways to simplify that process for them...! You also overstate your return policy, massively. You've got a product that is sensitive to minor personal differences and you go out of your way to raise that thought in someones head 70 or 80 times (maybe not an accurate count). Maybe instead of mentioning all the ways things can go wrong and that you will fix them all, you just make a simpler, bolder statement of 'satisfaction guaranteed or we will fix it at our cost' ... reassuring without raising the doubts of ill fitting footwear. It'd be interesting to see how many abandons you had from the FAQ page, or what percentage of your successful conversions viewed the FAQ. That being said Dold, I think the risk of understating the policy may be too great. I would imagine the "what happens if it doesn't fit" would be the biggest objection, and to undercook this would be a significant problem. If you were to cut this message down, you would have to create a direct link afterwards it with "for more info, click here"or something similar that takes you directly to the detailed returns policy. The effectiveness depends on the product, your customer base and your delivery mechanism. But, I have personally found that having a big range of designs for the same product is a great competitive differentiator. This is from my offline retail experience as opposed to an online product. I have customers coming to me direct rather than shopping around with my competitors because they KNOW that I have a bigger range. Why go to Shop 1, Shop 2 & Shop 3 when you know that Shop Dan has EVERYTHING...? Dold & David - That's a tricky one. I take your point Dold but I think I agree with David in that it's better to explain it. Only 2% of our visitors have been to the returns policy page, but that's likely to be the 2% most likely to convert so I should look at that data in more detail. The exit rate on that page is 18% which isn't overly high given we average about 5 page views per visitor. You've out Google analytics'd on seeing the percentage of successful conversion who viewed that page. I can't see a way to get that data either in the standard or custom reports. Do you know how Dold? Dan - good thoughts. There's no doubt the custom design element of our site and the range of choice that comes with that is bringing us traffic. We'd only have a very small percentage of our current traffic if it wasn't for that, it definitely gets the customers to our site. The issue is then having a good proportion of those visitors make a purchase. How do you go about that with your store? Is that Kaboodle Designs you've had that experience with? I'd love to chat to you about your fashion market experience. Bondi markets has gone well for us and it looks like you've done quite a few other ones as well. Mike I think the basic premise of your post is correct, but you can't apply it to your business. customers who go to Chappeli Cylcles know what they want (fixies)and yes they probably benefit from having a limited number of choices (see the success of In n Out burgers in the US as the perfect example). however your offering is based around choice, by very definition. Perhaps a best of both worlds aproach would be to offer a fast track process as discussed by earlier posters could be an option. just a couple of thoughts from Captain Hornblower. Yah, that's the one. We've been running fashion market stalls for the past 8 years or so all around the place. Glebe Markets, Bondi Markets, Kirribilli Markets plus the yearly festivals around the place. I will be at Bondi Markets this Sunday so we can have a chat if you are around as well. Or contact me via email on thatguy (at) dacheah.com. Google Website Optimiser should help you test some different conversion page designs. We have found that the best design for conversion is a page with only one point of conversion. No choice. The money page should also remove the nav elements, leaving just one point of departure "Buy Now". Across adwords, our landing pages now convert at 12% (on average). Our wedding photography vertical converts at almost 20%. Captain Hornblower - definitely fair thoughts about a lot of our traffic being traffic we can't expect to convert. Still, looking at our traffic sources in Google Analytics a lot of our traffic comes from fashion websites, and our Google AdWords conversion rate is also very low and that traffic is people searching for 'custom made shoes' and the like = super targeted. As you say, I think our best approach is to experiment with some ready made options. Daniel - Perfect, we're at Bondi Markets this weekend too so I'll definitely come by for a chat. Jeremy - Yeah, we've been playing with Website Optimiser a bit. Those are some excellent suggestions on having only one point of conversion of landing pages and removing the navigation elements on the payment page, leaving only 'Buy Now', we should try that too. 12% and 20% are amazing conversion rates for your AdWords traffic, well done and wow! 4. Finally, it's an interesting demographic you're targetting compared to the bike site. I don't know a lot about the cyclists market, but I'm guessing they're not quite the window shopping market women are ... particularly with shoes. Previous commenters have suggested that it will take more re-visits for someone to make a purchase on your site ... perhaps a strategy is not just a newsletter, but a reminder of what shoes a visitor has sitting in their profile. When I first checked out your site I played for hours ... designed a couple of pairs, had a bit of fun then had to tend to a wakeful toddler ... I know the shoes are there when I'm ready to buy ... but gee, if you reminded me every so often that they were waiting, that might encourage me to place that first order. Hi Cat, thanks so much for your thoughts. Great ideas around reminding people of shoes they've designed and saved in their account, we had been discussing that a little bit but hadn't really decided to act on it. I think you've just moved it right up the priority list for us... now we'll have to think of fun ways to make that reminder! Also a good point that women like to window shop and so we should expect a lower conversion rate. That also ties in nicely with gently reminding people to come back to the site after they've done their initial window shop. I came, I saw, I designed, but I don't know if your company is for real. So I haven't ordered yet. There is not too much choice, it is perfect. But how do I know you really exist and this isn't a scam to get my credit card number? Hi Anonymous - A fair question. We hope that's one advantage of us being so open about our business. Up to the left of this page you can see that we link to our Twitter profiles. If you visit our profiles you'll see we have lots of conversations with lots of other real people. If our business were a scam our reputations would be gone and we wouldn't be having these sorts of conversations. Also, feel free to visit the Shoes of Prey Facebook page. There are lots of great customer testimonials on there. Conveniently, the most recent post is from a customer who is so happy with the shoes she's just received that she'd made them her Facebook profile picture! Hopefully that all helps gain your trust! Thank you, Michael, I appreciate the feedback. I would like to see real contact information with a real address that is verifiable. Also, I would like to see multiple articles from real people who have ordered shoes and whose existence I know to be real independently of this site. For example, if several well-known media outlets were to order and report, this would be fairly convincing. I probably sound paranoid, but I have known people who order from retail sites with lots of blog mentions and they turn out to be scams. There are also some that started out as legit businesses but then stop shipping out product. It happens. Hi Anonymous - those are good thoughts, thanks. Notebook Magazine in Australia designed, ordered and features some shoes in their April issue so we should put that up online. We're planning to add a 'media' section to the site shortly so that should address this. In regards to our address that's a very valid point. We hadn't wanted to put an address up initially as the only one we had was our home addresses, but now we have an office we should put that up. Great idea, thanks! The thing that turned me off is the highly conditional returns policy. I love 100% unconditional returns. i.e. wear it, use it, do your worst and if you hate it, return it no questions asked. The wimpy returns are too conditional. Seriously, if I have a problem I have to get a local show repairer, and then send it back? Why not 100% guarantee with no conditions - its a $300 product with about $65 of cost! Hi Anonymous. Fair points and thanks for the feedback, though what retailer allows you to return something after you've worn it and used it? Also we don't stick to the letter of our returns policy in all cases. A couple of days ago we had a very good customer write in saying her shoes were water damaged. She'd got them wet but we're replacing them for her. In regards to sizing in most cases we don't actually have you take the shoes to your local repairer, that's only if you choose to do that. We should change the wording in our policy because you're right, it reads as you describe at the moment. Unfortunately our shoes don't cost $65. We'd love it if they did but the materials alone are quite expensive, let alone the labour to handmake each pair of shoes one by one. To top it off our shipping costs more than the $25 we charge customers. My personal opinion as to why you have a low conversion rate is less to do with the site and more to do with search engines. I also think it is pretty normal and nothing to worry about as your site gets more popular in search. Websites that have huge numbers of visitors tend to be ranking well in the search engines for lots of different keywords. Often many of these keywords may not be those used by those actively looking to purchase, they may be mostly clicked on by doing general searches. They click through looking for info and then leave the site. The more popular your site gets in search, your rankings improve for keywords with only a few terms, which are less specific and are known to have lower conversion rates. You will also continue to rank better for a large number of long tail keywords. Most of the long-tail searches will be random strings of words, which will be discovered and clicked on mostly by those not looking to purchase. Contrast this with a newly launched online store, they may not rank at all or only for a few highly specific search terms in their business niche. Those finding the site via these specific terms are likely ready to buy and searching specifically for a product to buy. The other visits may be from off-line sources. Hence a fantastic conversion rate. Brett - I certainly agree with you that a lower price point would help our conversion rate. I disagree about the retail therapy experience though. Since mid December for example we've had over 1.5 million people visit our website spending an average of 4 minutes on it. There are very few retailers in Australia, even the large chains, who would have had that many people through their doors. Women love spending time on our site - it's a fun experience for them designing shoes - though getting them to hit the purchase button isn't quite so easy. I should add that since writing this post 12 months ago we've managed to double our conversion rate on traffic from our target market - 25-50 year old women, though we've been picking up a lot more 12-15 year old female users recently who aren't in our target market so overall our website's conversion rate has dropped - eg. we haven't converted any where near 0.167% of the 1.5 million recent visitors, but sales have still been fantastic so that's ok.
Nick - good thoughts and I think that theory applies in that the traffic we receive isn't high converting traffic - particularly the 12-15 year olds visiting our website. It's not search engine traffic though. 15% of our traffic comes from search engines and the vast bulk of that is branded terms 'shoes of prey' 'shoesofprey' etc. Other than that I agree with your theory. Michael, this is a very interesting read. Thank you for following up on our progress! Regarding demographic targeting of various age groups, how exactly are you able to determine the conversion rate of a particular age group? Do you ask for age somewhere along the funnel? Actually, it's a lot of guess work, we don't ask for our customer's age. It's more around looking at our traffic sources and also the timing of our traffic and conversions. We know that our YouTube traffic is primarily teenage girls given the YouTube channels the traffic is coming from. That traffic is immense, over 1.5 million visitors, and they spend a long time on our site, but they convert very poorly. And it makes sense, a 15 year old is not going to be buying a lot / any $250 pairs of shoes. In comparison looking at the profiles of the people we interact with on our Facebook page, they're 25-50 and traffic from Facebook converts really well for us. The same goes for when we get coverage on fashion magazine sites like Marie Claire or Vogue, those sorts of mags target a 25+ fashion loving demographic and traffic from those sites converts really well for us. Reading your blog as someone who's considering staring her own online retake site (bait scary but also really exciting!). You said above 15 % of your traffic is from search engines. Do you mind sharing your other primary sources of traffic. It sounds like Facebook and YouTube are on the list? Hi Karen, our main source of traffic is direct - people typing www.shoesofprey.com into their browser. After that comes search engines, YouTube and Facebook. I didn't read all the above comments, so this might have been mentioned before - but what about visualization? A LaudiVidni style configurator would make it so much easier to imagine what the shoes end up looking like. And maybe size and resending it all the way to Australia might be an issue? I like the chappelli site , one suggestion to try ( I bet you a $5 you would see a spike)... Make that Buy bubble on the bottom left corner bigger and bolder. Don't get too crazy, just edge it up a bit until your conversions possum out. First impression, I wasn't sure if I could order online. I have not read everyones reply here. But I think the way Steve Madden shoes started their business in the US might be interesting for you. Steve Madden designed very (very) crazy shoes which people raved about and were put at the front window by retailers - they caused a lot of buzz. However, not very many people actually bought and wore these shoes. What did happen was that people would purchase the Steve Madden brand shoes that were more simple and in line with modern fashion - and they bought heaps of these. Anyway i will let you take a look for yourself. It is an interesting concept though. firstly average conversion ratios of 1-2% for all retail sites neglects the differences between different consumer groups and gender (touched on before) and most importantly neglects your product offering and point of differentiation which is what is driving much of the 'buzz' and traffic. to elaborate on the second point, the key area of differentiation is that you are one of a small handful of sites where customers can design your own shoes. This is the reason why i presume much of this traffic is being generated. Many of whom are simply there to check out the design features after a friend referral, and may not even be in the market for shoes at all. Would be far more interesting to compare apples to apples and your conversion rate vs say gemvara's or another customized retailer. I guess what im saying is that your website has become a destination in itself. The issue of "cognitive dissonance" springs to mind. Too much choice leads to no purchase. Head and Shoulders shampoo reduced their line of shampoos and increased sales. Wow, over 3 trillion possible shoe combinations it's cool! But I think you should give your customers some advices about how to choose among so many choices. In general, the more choices they have the happier they are, but that's not enough, Advices and instructions about that how they can find out what kind of combination they want is more important to you.